This is actually a bit of a comparison post between Ciate's Speed Coat and Seche Vite, but I can't call this a dupe post as Speed coat is actually slightly more expensive than Seche Vite. However, bear with me and I'll explain why I think you're better off spending that little bit extra and going for Speed Coat. As much as I love Seche Vite there are a couple of downsides to it. One is that although I find it very quick drying and super glossy I don't find that it prolongs how long my nail varnish lasts. I'm one of those people that nail varnish just does not last well on; even amazing formula's that might last over a week on some people will most likely chip on me within a couple of days. However the biggest downside to Seche Vite is it seems to be impossible to actually get through a whole bottle. There appears to be some kind of strange curse that means as soon as you get half way through the bottle it goes off and becomes unusable. Approaching half way I noticed that mine was starting to get stringy, as in I'd pull the brush out of the bottle and notice there was a thin string of varnish going from the brush to the bottle. This was annoying, but not too much of a problem, but as soon as I hit half way down the bottle it became all gloopy and just wasn't usable anymore. Now this is expensive enough, with prices online appearing to range from £8 up to about £11, but when you only get to use half of the bottle this isn't good enough. I've been mourning the loss of my bottle of Seche Vite. I do have several other bottles of cheaper top coat floating around but I just can't stand their drying time. I'm always doing something and there's no way I'm going to sit around for ages waiting for nail varnish to dry, so a top coat that still manages to smudge or get an imprint in it over half an hour after I've applied it is not good enough for me. 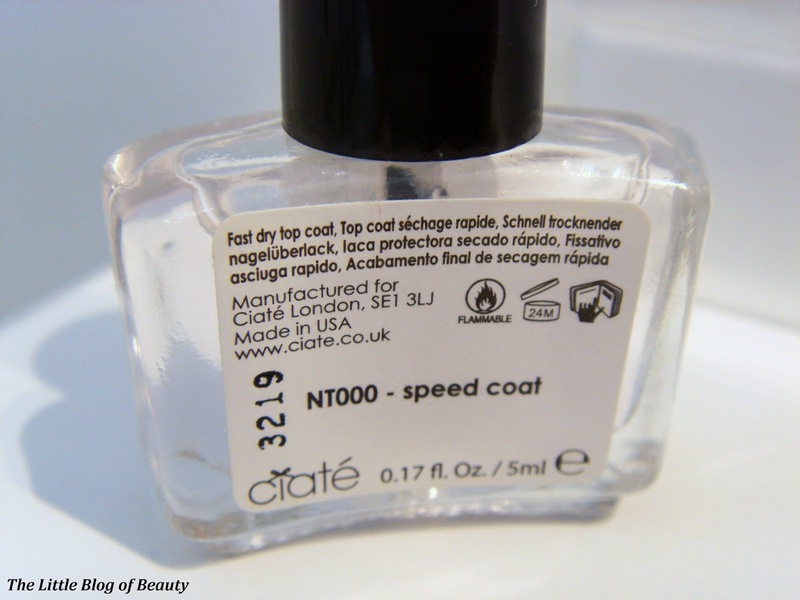 Enter Ciate's Speed Coat. 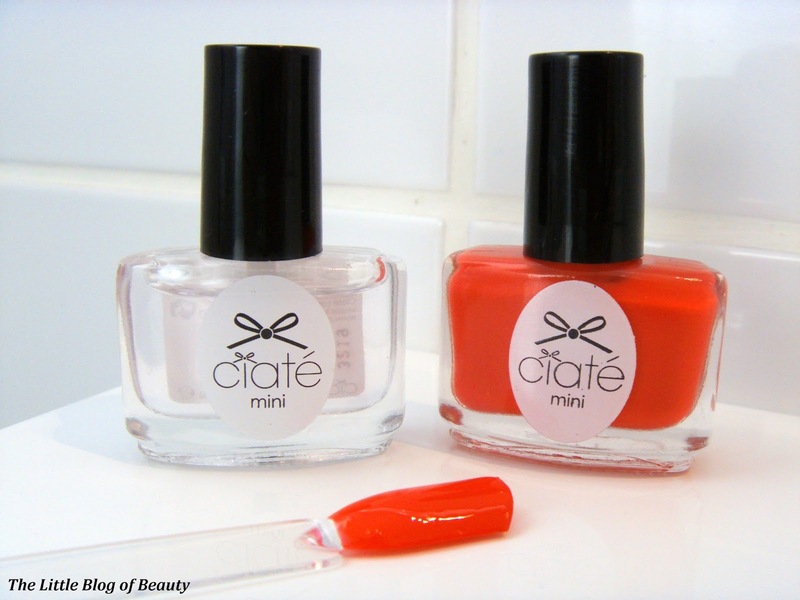 This was included in Ciate's advent calender which I got for a very discounted price at The Clothes Show live in December. Last week I decided to give this a try, along with one of the shades included in the calender, and I'm hugely impressed. 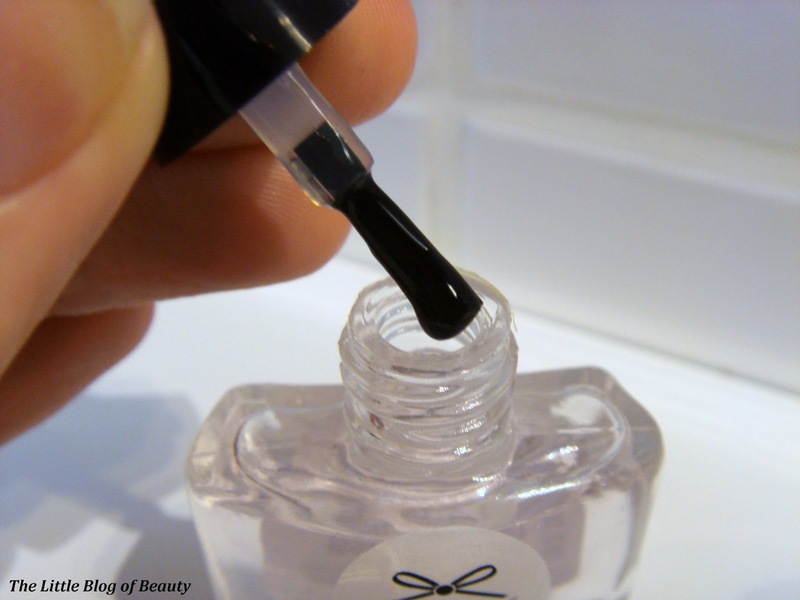 Just like Seche Vite this dries really quickly and provides an amazing glossy finish, but the best bit is that this actually does make my nail varnish last longer. I usually have at least one chip with 24 hours and within 48 hours I've usually started peeling my varnish off (I know, naughty!) because it's chipping, but using this I found that there wasn't a chip in sight after 48 hours. After that I found that it started to chip slightly on my right hand (I'm right handed) but the left hand was still pretty much chip free. I think it got to about four days before I started peeling this off. So for me, this is a big winner! A full size Speed Coat costs £11 for 13.5ml. As I said, although this is more expensive than Seche Vite (and you also get just slightly less product as Seche Vite includes 14ml) I would definitely go for this one as I'm assuming that it doesn't go off half way through. As I've only used a small amount so far I can't say this for definite, but if once I do get half way down it does go off I'll eat my hat and write a post to let you know! While I'm talking about Ciate I thought I might as well show you my current favourite Ciate shade, which is the shade I've been referring to above. To be honest it's not really worth me including photos of this shade because as usual my camera has changed a red type shade to orange! I've tried to mess around with the white balance on my camera to stop it doing it, but I can't seem to get it to work. So I'm sorry the colour is wrong :( This is actually Play Date, which Ciate describe as a 'bold pop pink with a playful coral edge'. The reason I've included this shade in the post is because I find it kind of special. Last week I decided it was time to crack out a bright pink shade to try and combat the pretty dreary weather we've been having. However despite deciding to use this because it looked like a bright pink, as I was applying it I thought it actually looked like more of a orangery red. Then when I was driving the next day I caught sight of my nails and thought now it looks like more of a traditional red shade. So basically what I'm trying to say is that this shade looks slightly different colours in different lights and I'm currently loving it paired with my pale fingers. 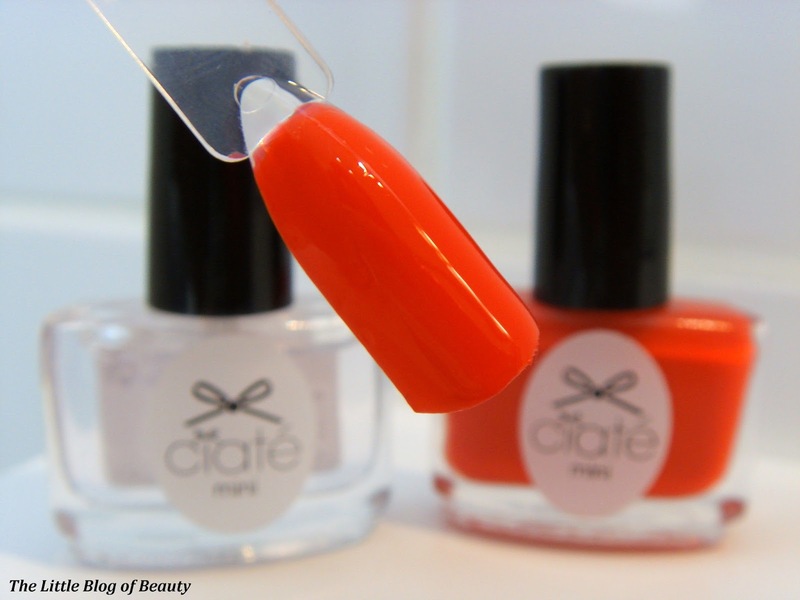 What's your favourite top coat or current favourite nail varnish shade? Laura | A Life With Frills I've been on the hunt for a really good top coat, so think I'll give this a try. Thanks!